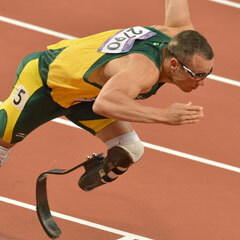 Cape Town - Double amputee Oscar Pistorius's historic Olympic campaign gained a reprieve on Thursday as South Africa were given a place in Friday's 4x400m relay final on appeal. Pistorius, 25, thought his adventure had come to an end when second leg runner Ofentse Mogawane fell on the bend into the home straight after tangling with Kenya's Vincent Kiilu. However, Kenya were subsequently disqualified, prompting South Africa to appeal. "The Jury of Appeal met and agreed to advance the South African team to the final, even though they did not finish the race, considering that they had been severely damaged in the incident with Kenya," said the International Association of Athletics Federations (IAAF) in a statement. "South Africa will run as an additional team in lane 9." Pistorius tweeted his happiness at the news: IT'S ON!! We in the FINAL. Team management Protested as Ofense was taken out and we have been given Lane 9!! @ljvanzyl to take his place!!! South Africa will be represented by LJ van Zyl, Pistorius, Willie de Beer and Shaun de Jager in the final, which will be contested on Friday at 22:20 SA time.